We were invited to stay at the Angelo by Vienna House hotel which is located across the river from the Old Town and about a 25 minute walk from Charles Bridge. The area around the hotel is bustling with shops and cafes but, as it’s not right in the heart of the packed tourist area, it’s a nice location which allows you to enjoy the city but stay just the right distance away from the famous nightlife. Vienna House is the largest hotel chain in Austria and they have various locations throughout Europe. Each hotel is designed individually and the Angelo hotel in Prague is decorated in a red, yellow, black and white theme with a jazz bar and comfy seating complete with a fireplace on the ground floor which is a nice place to grab a coffee or a beer. The hotel rooms are comfy, spacious and the attention to detail is perfect. When we arrived we were treated to handwritten welcome notes, two fresh fruit baskets which had been intricately prepared and home-made virgin mojitos along with a welcome pack of gifts and fresh robes which we quickly jumped into. We ordered some room service which was delicious and very reasonably priced. Breakfast was included and offered a range of meats and cheeses, fruit, cereal, pastries, juice, coffee and more. I would highly recommend checking this place out when you visit – we received the very best service during our entire stay and would love to go back! So onto the Prague guide; here is my list of top things to do in Prague that don’t entirely fit the “British Lads on Tour” stereotype. Charles Bridge is one of Prague’s most popular tourist attractions. The Medieval structure was built between 1357 and 1402 and is lined with 30 statues spaced across each side of the bridge. Each statue represents a Saint, with one of them being the patron saint of the Czech Republic. Make sure you get here early as the place is extremely popular with tourists and will be pretty crowded even by 8am. We arrived at 6:30am and, as you can see from the photo, we were very much not alone. For over 600 years, the residents of Prague have been able to head down to the Old Town in order to see what time it is. The clock is the third oldest clock of it’s type in the world and is the oldest one to still be functioning today (although it is currently closed off for repairs until the tail end of 2018). People gather in the square to watch how the clock chimes each hour with the figures decorating the edges of the clock moving with the chimes. After viewing the Astronomical Clock, take a slow walk around the Old Town square and the surrounding streets to feel like you’ve been thrown into a Medieval fairytale. Prague has some of the prettiest architecture I’ve ever seen with the ground floor of most buildings being occupied by a cute cafe or lovely shop that you can get lost in for hours. The narrow cobbled streets surrounded by tall, intricately decorated buildings are perfect for snapping some good photos. So obviously I couldn’t write a blog post on Prague without mentioning the beer. The Czech Republic is known for “the beer being cheaper than the water” and while this isn’t 100% true, it’s pretty much there. Many of the bars are actually breweries and the beer that the bars sell is produced in the basements of the bars themselves. We booked a tour with Beer Prague where we visited three breweries and sampled many beers (the exact number I don’t really remember.. so clearly it was good fun). The final brewery we visited was located on a boat that was fixed to the side of the river and a small meal was included at this last brewery in the price. Our guide was called Jimmy, we ended up hanging out with him all night even after the tour which was great (he stupidly told a group of drunk people where he was heading to meet his friends afterwards so naturally we followed him there) and he gets a 5* review from me. Jimmy was able to answer all of our serious and less serious, more drunk and stupid questions and had a really good energy which made the tour so much fun. I would request him as your guide if you book with this company (however if Jimmy offers you a chance to taste the hops seriouslyyyy give that one a miss – it tasted like I was eating a tea bag and it was awful haha)! The Petrin Lookout Tower is 63.5m tall and is located in a park on a hill 318m above Prague. The tower can be reached on foot, in a car or via a cable car and you can either walk up the 299 steps to the top or take a lift. Built in 1891, this is an attraction sometimes overlooked by visitors to the city and was recommended to us by Marketa at the Angelo by Vienna House Hotel. The views from the top are incredible and it only costs 150CZK (about £5) which is totally worth it. The Jubilee Synagogue (sometimes known as the Jerusalem Synagogue) is possibly one of the most beautiful buildings I’ve ever seen. Inside and out, the colours are so striking and the details are so intricate that you really should try to fit in a short stop to see it on your trip. We decided to treat ourselves to a nice meal and stumbled upon Grand Cru on Trip Advisor. The food was absolutely outstanding and the service was impeccable. We shared a starter, had two mains and a couple of drinks and the price was less than £100 which was absolutely worth it. I highly highly recommend you visit this place for dinner if you go to Prague and make sure you try the traditional Czech bread with the ash flavoured butter (okay that sounds gross, but trust me on this it was divine)! 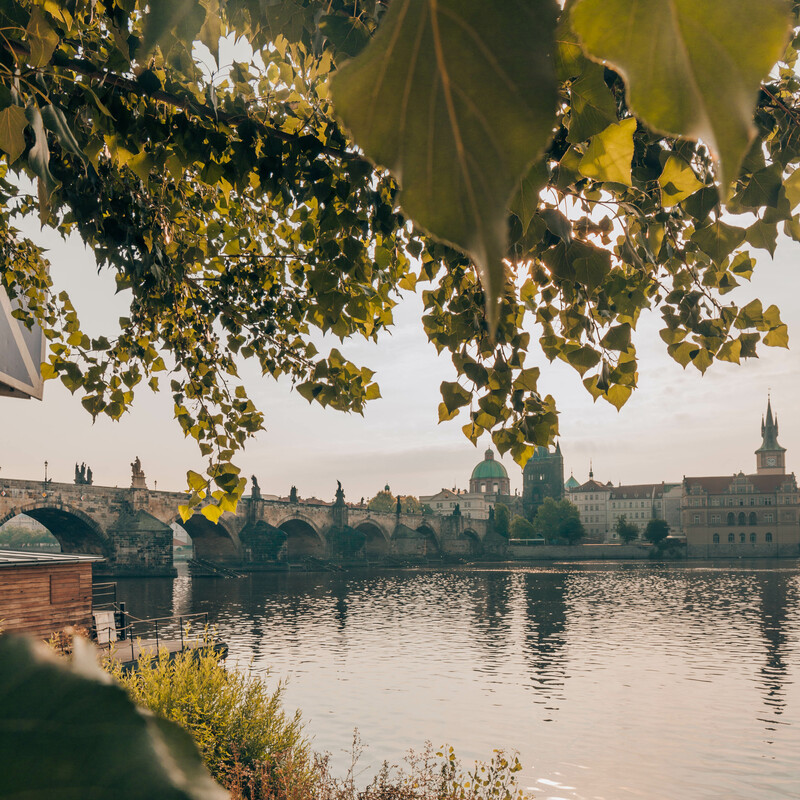 If Prague wasn’t on your list before I hope it’s a destination you’ll soon consider. It’s super easy to get around as it’s relatively small plus it’s very affordable for a city break destination. We loved meeting you too! And we loved Prague, it’s such a pretty place and so full of culture.